For some companies, scanning Kodachrome slides is a challenge because they do not have the professional software & professional staff to handle difficult film like Kodachrome. As you can see from the images to the right, Kodachrome film has a strong blue cast. Certain measures are taken when we encounter Kodachrome slides. First, we have specific settings we apply to Kodachrome slides to reduce the amount of blue cast that is visible in the digital scan. After the slide has been scanned, we have trained photo editors that can eliminate the blue even further. 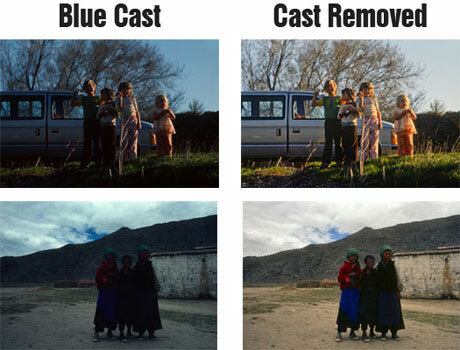 While we do our best to remove the blue cast in Kodachrome film, individual results will vary based on the original condition of the slide and the extent of the blue cast.